Chert is a fine-grained, silica-rich, microcrystalline, cryptocrystalline or microfibrous sedimentary rock that may contain small fossils. It varies greatly in color (from white to black), but most often manifests as gray, brown, grayish brown and light green to rusty red; its color is an expression of trace elements present in the rock, and both red and green are most often related to traces of iron (in its oxidized and reduced forms, respectively). 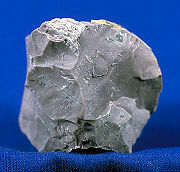 1 Concerning the terms "chert," "chalcedony" and "flint"
Concerning the terms "chert," "chalcedony" and "flint"
There is much confusion concerning the exact meanings and differences among the terms "chert," "chalcedony" and "flint" (as well as their numerous varieties). In petrology the term "chert" is used to generally refer to all rocks composed primarily of microcrystalline, cryptocrystalline and microfibrous quartz. The term does not include quartzite. Chalcedony is a microfibrous (microcrystaline with a fibrous structure) variety of quartz. Strictly speaking, the term "flint" is reserved for varieties of chert which occur in chalk and marly limestone formations. Among non-geologists (in particular among archaeologists), the distinction between "flint" and "chert" is often one of quality—chert being lower quality than flint. This usage of the terminology is prevalent in America and is likely caused by early immigrants who imported the terms from England where most true flint (that found in chalk formations) was indeed of better quality than "common chert" (from limestone formations). Among petrologists, chalcedony is sometimes considered separately from chert due to its fibrous structure. Since many cherts contain both microcrystaline and microfibrous quartz, it is sometimes difficult to classify a rock as completely chalcedony, thus its general inclusion as a variety of chert. The 3.2 billion year old chert of the Fig Tree Formation in the Barbeton Mountains between Swaziland and South Africa preserved non-colonial unicellular bacterial-like fossils. The Gunflint Chert of western Ontario (1.9 to 2.3 BYA) preserves not only bacteria and cyanobacteria but also organisms believed to be ammonia-consuming and some that resemble green algae and fungus-like organisms. The Apex Chert (3.4 BYA) of the Pilbara craton, Australia preserved eleven taxa of prokaryotes. The Bitter Springs Formation of the Amadeus Basin, Central Australia, preserves 850 MYA old cyanobacteria and algae. The Devonian Rhynie chert (400 MYA) of Scotland has the oldest remains of land flora, and the preservation is so perfect that it allows cellular studies of the fossils. In some areas, chert is ubiquitous as stream gravel and fieldstone and is currently used as construction material and road surfacing. Part of chert's popularity in road surfacing or driveway construction is that rain tends to firm and compact chert while other fill often gets muddy when wet. However, where cherty gravel ends up as fill in concrete, the slick surface can cause localized failure. Hauled prices for chert of less than $10 to $15 per ton are not uncommon in many parts of the U.S.
Flint is a compact microcrystalline quartz. It is found in chalk or marly limestone formations and is formed by a replacement of calcium carbonate with silica. It is commonly found as nodules. This variety was often used in past times to make bladed tools. Opal is a hydrated silicon dioxide. It is often of a Neogenic origin. In fact is not a mineral (it is a mineraloid) and it is generally not considered a variety of chert, although some varieties of opal (opal-C and opal-CT) are microcrystalline and contain much less water (sometime none). Often people without petrological training confuse opal with chert due to similar visible and physical characteristics. Other lesser used terms for chert (most of them archaic) include, firestone, silex, silica stone and flintstone. ↑ George R. Rapp, "Archaeomineralogy" (2002, ISBN 3-540-42579-9). ↑ Barbara E. Luedtke, "The Identification of Sources of Chert Artifacts," American Antiquity, Vol. 44, No.4 (Oct., 1979), 744-757. ↑ THE EARLIEST LIFE: Annotated listing Retrieved December 25, 2008. ↑ Fig Tree Formation of South Africa Retrieved December 25, 2008. ↑ Gunflint chert Retrieved December 25, 2008. ↑ Biogenicity of Microfossils in the Apex Chert Retrieved December 25, 2008. ↑ Cyanobacertial fossils of the Bitter Springs Chert, UMCP Berkley Retrieved December 25, 2008. ↑ Willard Lincoln Roberts, Thomas J. Campbell, and George Robert Rapp, Encyclopedia of Minerals, 2nd ed. (New York: Van Nostrand Reinhold, 1990, ISBN 0442276818). ↑ Richard Scott Mitchell, Dictionary of Rocks (New York: Van Nostrand Reinhold, 1985, ISBN 0442263287). This page was last modified on 9 February 2017, at 19:35.